My friend sent me a link on Teresa Kok’s Chinese New Year greeting video clip. It is a political satire and some of the issues are more familiar to general Malaysian folks and the satire is best understood by people who have some familiarity in Cantonese and Chinese; also one must understand current Malaysian political development. I am only interested in the first part of it as it made use of some astrology ‘stars’. In order to read the meaning behind it, ‘star’ (星) reads ‘seng’ in Cantonese, it has the same pronunciation as ‘hike’ or ‘rise’ (升). So, let’s have a good laugh, and get back to work hard! Many people are afraid of ghosts. There are basically two types of folks who are not afraid of ghosts: the first are the Lower Mao Shan Taoists and the other are gamblers. The Lower Mao Shan (下三茅) system works with spirits of the deceased, or ‘ghosts’ for short. Within the Lower Mao Shan School, there are many type of ghost magic: the notorious 5 ghosts (五鬼混天), the willow kid (柳靈童), the shaman ghost ritual (沙門練鬼), 5 legionnaires (五營兵) and etc. Unfortunately speaking, Lower Mao Shan School is a dying art, i.e. you practically can’t find Lower Mao Shan Taoists now days. So, only gamblers exist these days. If gambling and money are two main objectives, we cannot pray to Buddha for money as the Buddha said: everything is ‘empty’, empty and empty. Likewise we cannot pray to Taoist masters as they said: “By doing nothing, people can do everything.” So nothing is done indeed. What left now are only two options: gods/goddesses and ghosts! Indeed, it is useless to beg the gods and goddesses as they already possess everything human has to offer. On the other hand, the ghosts have nothing to lose and they will be happy to enjoy some food offerings and some joss papers in exchange for their services. It is a win-win deal; why not? So, if one is a gambler and one has no Mao Shan background; and yet still want to use our good brothers (ghosts), I will still list some simple rituals. But my heartiest advice is not to try as these good brothers are pretty unpredictable. For the inspired, he/she must first choose a new grave; the grave must be within 49 days of those who died young yet violent. This ritual is best to be performed alone at night, best if it is a full moon night. When the time is right, go to the deceased’s grave with some food offerings, a long piece of green bamboo, a hammer to strike the bamboo, incense, joss paper and a pair of white candles. After lighting the candles and incense, arrange the food offerings on the floor and then strike the bamboo into the grave. The tip of the green bamboo must touch the top of the coffin cover. When this is done, stand in front of the grave again and say out loud what help you required from the deceased. Wait until the incense and candles are half burnt then burn the joss papers too. If the ghost does appear, do not be afraid for it will not harm the person who performed the ritual. Yet another variation of this ritual is to pick a new tomb of a woman died in childbirth. In addition black dog blood is poured into the green bamboo to force the ghost to comply with the requests. It is said that the later ritual is more powerful but the ghost will be difficult to control. Old folks believe that the rich once kicked the bucket, will still possess certain amount of fortune (財氣) so if this fortune is not make use of within 49 days, then the fortune will be wasted. First, one must choose a rich guy’s tomb and that this person must also died of unnatural death. Prepare offering stuffs as above, but this time there is no need to use the green bamboo stick. Now one must prepare 5 pieces of color paper each for: green, red, white, black and yellow. So there all 25 pieces of papers altogether. These color paper will subsequently be buried in eastern corner, southern corner, western corner, northern corner and center. The idea is to use the 5 legionnaire armies to gang up against the rich ghost for money. As in ritual 1, one has to lay all of the offerings in front of the tomb stone, read out loud of his/her wish and finally leave the scene without looking back. The rich ghost may or may not materialize in front of the person, but he/she will visit the person in his/her dreams. Whatever the case may be, one must tell the ghost explicitly what he/she wants. Perhaps Ritual 1 and 2 are not suitable now days as most people choose to be cremated and modern cemeteries are guarded at night. Having said so, we will never know when we will have such opportunities. 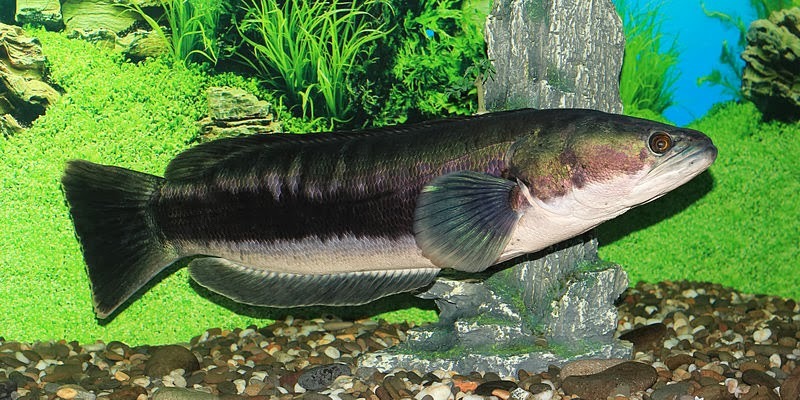 A toman, or giant snakehead is said to be a lelembut's pet. In the West, water spirits are called Nymphs or Undines. In Malaysia, there are many types of water spirits and ‘lelembut’ is just one of them. Local folks believe lelembut is same as ‘orang bunian’ in that they also lead a family life in a village. It is said that a lelembut spirit looks as if a very pretty maiden holding a toman (giant snakehead) in her arms while playing beside fresh water lakes. Only a handful of lucky folks can see lelembut and allowed to enter their village or stay with them. Lelembut generally shy away from human civilization. They like to congregate on wetlands, lakes, rivers and seaside. However, they are not as popular as other types of spirits as lelembut cannot be kept and control like those of ‘hantu raya’, ‘polong’ or ‘pelesit’. Once the dwelling place of lelembut is intruded by mankind, they will move away and seldom confront the intruders directly. At the place where lelembut stays put, fishes will be in abundance. Amongst the fishes, it is believed that toman fish especially large ones are the favorite of lelembut. The locals said that experienced anglers who fish at the place controlled by lelembut will go back empty handed; even though the area is renowned to be abundance with toman and snakeheads. A few years back I accompanied two angler friends to fish in Kenyer Lake. We were on a boat rented for one whole day in the hope to catch some toman fish. An adult toman can grow up to 1m in length and weights around ~20kg or so and it never gives up without a real struggle. Anglers get the thrill while the toman struggles for their lives. I am never an angler, actually I was there just to make up the numbers; my interest then was our next destination: Dungun. Our boat owner was an experience local; he brought us to the western end of the lake and let us does the fishing while he was minding his own business. While my friends were fishing from both sides of the boat, I was leaning my back against the aft of the boat looking towards the bow. I can’t remember how many times I fell into slumber and how many times I was awoken by the shake of the boat due to fish pulling fishing lines. It was perhaps around 4pm and the surrounding was quite bright. I was half awaken by a scream, seemed that someone had possibly caught a big fish and by the way the line was pulled; everyone was certain that it was a big toman. As I moved my sight from the bow to where the commotion begun; I thought I saw a lady in white staring at me with seemingly agitated expression. She had wide round eyes, long straight shoulder length hair, and extremely fair complexion. As soon as the lady had spoken, a disappointed shout switched my attention to the commotion. Apparently someone’s line has snapped and the fish just got away. It was strange as after the sighting, no one on the boat had caught any fish for the next two hours until sun set when we called it a day. I am not sure if the sighting was a lelembut or just my hallucination after sleeping under heat. It was an interesting mystery for my notebook however. The fact is that it is sufficient by mastering a single type of occult knowledge alone as this already can make a comfortable living. Having said so, a Feng Shui sifu must also have reasonable knowledge in astrology as they are inter related. Those people who have learnt Flying Star Feng Shui (玄空風水) should also learn the Purple Star Astrology (紫微斗數) as both systems are related to each other. Let’s take 8 Characters (八字) for example if a person is born in winter period, fire element is very important in neutralizing the winter coldness. So, this type of person should avoid using cold color series (blue and grey) in his/her bedroom. The bedroom location should ideally not located at cold direction, namely the north. I remembered that one of my rich client, Mr. Foo who stayed in Johor. This gentleman’s 8 characters forbids water element but he built a large man made tall wall with waterfall besides other water fountains in the periphery. As if that is not enough, Mr. Foo also constructed a large fish pond in the center of his living room. I can assure you that you will definitely be impressed with this 100 square feet mansion. What happened next was during the year of metal (庚申); the water element is empowered to the max and Mr. Foo’s business also dropped to the historical bottom of his career. Apparently, whoever performed Feng Shui audit on Mr. Foo’s place had overlooked the importance of astrology as well. At home, we worry if our kids are behaving themselves. At school, we worry that we cannot obtain good marks in exams. At work, we worry about our bosses and our work performance report. The lists just go on and on. Other than to blame it to our collective bad karma, I offer you below Tibetan mantra taken from ‘Collected Works of Mipham’. If you recite the above mantra regularly, then you will have a calm mind and free from anxieties. It is also said that this mantra will also bless all of your love ones and that they will not leave your side. No matter where one goes, he or she will be taken care of, and that this person will have every success in life. Although there are many versions of this mantra, but I am confident the effects and benefits are as mentioned. One more thing, whatever you want to do, never jump off from the window; and please also don’t get too near the window for I cannot replace your wife or husband! Talking about ways to convert karma is very interesting. To me and according to Confucianism, we need to go through all of the 5 pillars to purify our current karma. I am no expert, so let’s just have a light discussion. Our fate can be foretold with palmistry, face reading, astrology and any other fortune telling techniques. This fate of ours once fixed cannot be changed as it is governed by our previous karma. One particular type of palm is the ‘broken palm’ (斷掌). It is fated that people with this type of palm are persistent, hardworking and an entrepreneur. This type is traditionally good for men but too strong for a woman; in yesteryears of course. We all know that things had been changing in our modern times! Thus, it was a scholar’s responsibility to understand not only his/her fate, but also his/her parents’ as well so as to avoid danger. It is by the deed of taking care of oneself that prevents our parents from fallen into grief. So, good fate is certainly not enough. For example, if one is cleaver and hardworking, but his/her luck is not on his/her side and no one wanted to hire this person; then he/she still starves to death. No matter how well his/her fate is. Having said so, our luck is subject to changes with time as we are creating and destroying karma constantly. For example, the minor lines on our palms will change in time indicating our fate in current time or near future. In old days, a scholar must know his/her parents’ luck and if it is calculated that the parents’ lives are ending; then he/she shall not travel far for obvious reasons. Feng Shui is a type of geomancy and it can be subdivided into two branches: the Ying and Yang Feng Shui. Not many people understand that the original purpose of Feng Shui is not for gaining money, but the art of Feng Shui is actually meant to look after our parents and our ancestors. While our parents are alive, we want them to live comfortably; hence a good Yang Feng Shui. And when our parents passed away, we want them to rest in peace in Ying Feng Shui. So, Ying Feng Shui is just to make sure that our beloved ones will not be disturbed by flood, animals or insects. Needless to say, a person must be educated to make his/her ancestors proud. This is especially true in ancient China where ordinary folks can only climb up a social ladder through public exams held by the old dynasties. This fact remains to be true at this modern time. However, time has changed: there are so many graduates now days with lesser job opportunities; unless these educated people with a good fate and luck and with silver spoons in their mouth, they remain helpless. · Repent, repent and repent that we are all sinners! · Donate to the temples so that the temples can expand to bigger ones. Just a point to add, originally according to Confucianism, a scholar should accumulate merits on behalf of his/her parents so that his parents can have good rebirths. Well, things have changed since. According to Confucianism, we perform the 5 pillar exercises to honor our parents and ancestors. By taking care of our parents and our ancestors, our blood lines will be looked after by those spirits and the spirits will help us when in need. And when everything is in order, our society will prosper. Having said so, the 5 pillars had been broken and instead of treating them holistically, cunning modern folks just exploit individual pillar for achieving their selfish gains. She Put Phra Ngan Into Her Xxxxx!! Spirit Of Ouija, Please Let Me Go!